After the disastrous single-volume “Redemption Of Althalus”, Eddings went back to the familiar multi-book fantasy series, in this case a series called “The Dreamers”. 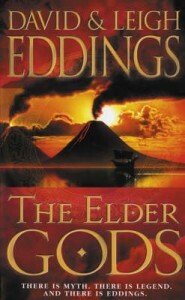 The first book in the series was 2003's “The Elder Gods”. The plot does have some potential to be better than that of the terrible “Redemption of Althalus”. In this world, the land of Dhrall is ruled over by eight Gods – four of whom are 'awake' at any one time. Every few millennia the Gods swap with their sleeping counterparts – unfortunately this period of changeover leaves their land briefly vulnerable. A nasty evil God called The Vlagh, who rules the wastelands at the centre of Dhrall, is poised to strike with his mutant armies while the land of Dhrall is vulnerable. To counteract this problem, one of the awake Gods cunningly awakens his sleeping counterparts early, they are incarnated as small children who lack the knowledge they usually have, but also benefit from not having to be constrained by the laws that usually govern the Gods. In a rare move, the main focus here is on the various Gods as they gather up a bunch of assorted mortals to recruit for them a foreign army to defend the land of Dhrall from The Vlagh's invasion. The plot is relatively original by Eddings’ standards, although there a few traditional Eddings elements incorporated. It also makes a change for the main characters being the Gods manipulating the situation rather than the mortals being manipulated. Eddings also breaks with his tradition by not having one main character. Unfortunately, while the plot may be a bit better than his last effort, some other aspects of his writing have gone downhill. Some of the prose is decent, unfortunately Eddings' former strong point of dialogue has gone horribly wrong. This is compounded by the flat simplistic characterisation of the mortal characters, with the result that Eddings' previous strengths are absent here. The dialogue is lazily written and seemingly no effort has been put into the characterisation – it is therefore impossible to care about the bland characters that populate the tale. In summary, the plot has the potential to be interesting but the potential is wasted by some awful dialogue writing and lazy characterisation. I know that you probably don’t give a damn – but Redemption of Althalus was NOT a disaster. It maintains a permanent place on my physical bookshelf. I’ve read it at least once a year since the day I bought it new off a shelf. I’ve not really liked any of Edding’s other books, so I take it as a slight that you’d call the only book they wrote that I do like bad. I’d have liked to have seen more of Althalus’ world, but what I DO have is fantastic enough for my tastes. And I am well read. Having enjoyed Eddings’ previous novels, I remember I was really looking forward to The Redemption of Althalus, and I bought it in hardcover the week it was released. I did like some things about it, I thought Althalus himself was an interesting character, so perhaps disastrous is being a little bit harsh, maybe disappointing would have been a better description.